In 2012, Americans spent $325-billion on prescription drugs. Included among the best selling drugs were cholesterol-lowering statins and a popular blood thinner. What do the two medications have in common? Certain cholesterol-lowering drugs and blood thinners can lower your Ubiquinol levels. To recap, Ubiquinol is the unoxidized state of Coenzyme Q10, or CoQ10, which provides greater antioxidant levels. The body must convert CoQ10 to Ubiquinol in order to use it for cellular energy production, which is referred to as ATP. ATP is the molecule in every cell of your body that plays a unique role in the rapid transfer of energy and overall cell function. Preliminary research indicates that Ubiquinol may be successful in treating people with certain heart conditions like congestive heart failure, chest pain, and heart problems linked to cancer medications. It may also be used to treat other conditions, including high blood pressure and chronic fatigue syndrome (CFS). Aside form increasing energy levels, Ubiquinol may assist with the treatment of many other serious conditions like HIV. Some studies have linked Ubiquinol with improving a weakened immune system. Other research has revealed that Ubiquinol in oral dosage has improved the muscle performance of those with muscular dystrophy, although further research is still needed in these areas. One of the most prescribed medications in the United States is generic Zocor, a cholesterol-lowering drug. In 2010, there were 94.1 million prescriptions written for generic Zocor. This drug is reported to assist in avoiding cardiovascular problems by lowering the LDL cholesterol (or "bad" cholesterol), but research has shown that these drugs also lower natural Ubiquinol levels in the body and the heart muscle. A published study in the Journal of the American Medical Association revealed a 22 percent decrease in Ubiquinol levels in patients using simvastatin (Zocor). Further research indicates that long-term use of these statin drugs may increase nerve damage and breakdown of muscle tissue. Some of the side effects of many cholesterol-lowering drugs, aside from a decrease in Ubiquinol levels, include muscle pain, low energy, eczema, heartburn, head pain, dizziness, and stomach cramps. Supplementing with Ubiquinol or CoQ10 can help with energy levels, which in turn may also alleviate muscle pain. Check with your physician about adding Ubiquinol to your health regimen to lower side effects of your current statin prescription. Blood pressure medications including Labetalol (Normodyne or Trandate) and Methyldopa (Aldomet) are known to lower the body's natural levels of CoQ10 and Ubiquinol. Some clinical research also shows that in addition to helping replenish the body's Ubiquinol levels, a Ubiquinol or CoQ10 supplement may decrease blood pressure for those who suffer from hypertension. 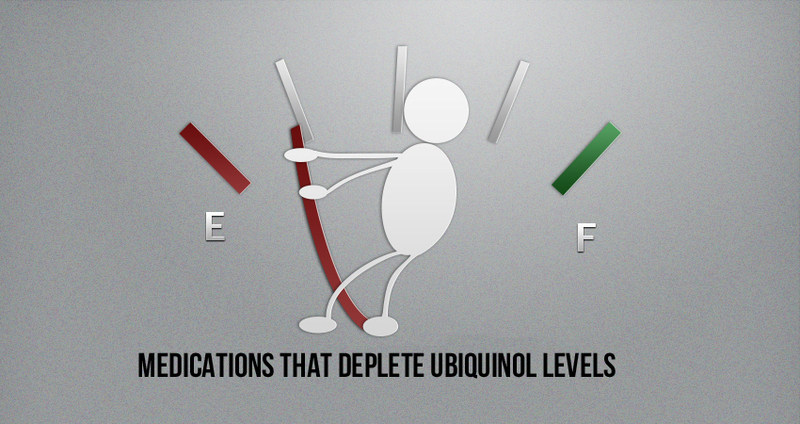 Combined with generic blood pressure drugs like Prinivil and Zestril, patients may experience lower than normal blood pressure when supplementing with Ubuquinol. When considering Ubiquinol as a supplement, it’s important that you talk to your physician first before adding it to your daily regimen. While you may hear about heart-related medications and their effects on your body's natural Ubiquinol levels, many other prescription and over-the-counter drugs can rob your body of its natural CoQ10 and Ubiquinol and hinder your body's production of these essential nutrients. For example, many common antibiotics, including Amoxicillin and Azithromycin (Z-Pak), can deplete your body of its natural Ubiquinol stores. Over-the-counter antacids including Maalox, Tums, Rolaids and Alka-Seltzer can also decrease your body's natural CoQ10 and Ubiquinol levels. Consult our medications page for a longer list of Ubiquinol-depleting medications. While taking Ubiquinol may help restore your body's Ubiquinol levels and help counter the side effects of some medications, always talk to your doctor first. Your doctor can tell you the dosage of Ubiquinol in combination with your prescribed medication that is safe for you.